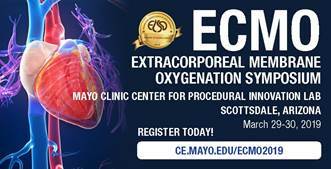 This highly immersive hands-on workshop provides the latest techniques and technology surrounding the clinical use of Extracorporeal Membrane Oxygenation (ECMO). Through integrated clinical scenarios, providers will apply knowledge gained towards the initiation and management of ECMO on simulated cases of acute respiratory and hemodynamic failure. Participants will deepen their understanding of the applied physiology of both venovenous and venoarterial ECMO, utilizing the highest fidelity simulation labs and its interaction with conventional life support treatments. Attendees will continue to build on the ECPR training provided with high intensity hands-on skills sessions. Participants will resuscitate using ECMO, mechanical ventilation and point of care lab testing, while instructors use ultrasound, exhaled CO2 and invasive hemodynamic monitoring to facilitate learner visualization of applicable physiologic principles. AMA Credit: Mayo Clinic College of Medicine and Science designates this live activity for a maximum of 16.25 AMA PRA Category 1 Credits™. Physicians should claim only the credit commensurate with the extent of their participation in the activity. AOA Credit: This program has been accredited by the American Osteopathic Association for 16.25 credits of AOA Category 2-A.